Winter, after irrigation systems have been put to bed for the season, is a vulnerable time for the theft of backflow preventers. After irrigation systems are winterized in late fall the backflow prevention devices can be removed because there is no water in the pipes. While irrigation systems are off, property owners could easily overlook a missing backflow preventer—out of use, out of mind. Why are backflow preventers so appealing? The fact is, their metal can be sold at scrap yards for cash—and it’s a fast way for thieves to make money. And because property owners probably won’t realize the backflow preventer is gone until spring, thieves get away with the crime. 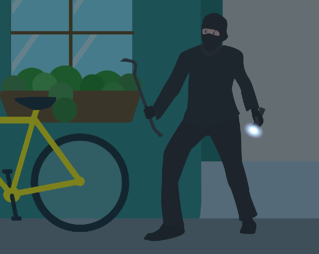 Who’s going to figure out the culprit months after a theft? The problem is, backflow theft can blow a property owner’s budget—they’re not cheap components. Backflow preventers for commercial properties can cost $1,000 to $10,000. 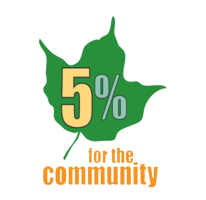 The price ranges, as you’ll pay more for reduced pressure backflow preventers cost more than anti-siphon valves, which are suitable for irrigation systems with six or fewer valves. Double-check backflow preventers and pressure vacuum breakers tend to fall in the mid-range of the pricing scale. Many properties have multiple backflows due to the size of their property which increases the chances of theft and the cost of replacement. Ultimately, the cost of the backflow preventer depends on the size and complexity of the irrigation system. Now that you know backflow theft is a problem—and it can happen on any commercial property that isn’t protected—let’s share the good news. There are simple, inexpensive steps you can take to prevent backflow theft. The purpose of a backflow prevention device is to prevent non potable (unsafe) water from entering the water supply. The device works by allowing water to flow out of the municipal water supply into the irrigation system—and preventing unsafe water from flowing back into the potable water supply. Backflow preventers basically work like a gate that allows water to go out, but stops water from coming into the municipal water supply. They can be quite large, sticking out up to 24 inches from the ground—and above-ground installation is required. To work properly, backflow preventers must be installed a specific number of inches above a property’s highest elevation. Backflow preventers are required by most municipalities and must be routinely inspected by a certified professional. 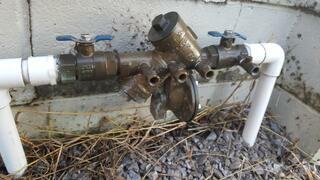 It is usually during the spring inspections when the theft of the backflow is first discovered. As noted, theft of backflow preventers is most common during the off-season when an irrigation system is not in use. If someone were to remove the backflow prevention device in the summertime, water would spurt out of the system—the theft would not be a covert operation. 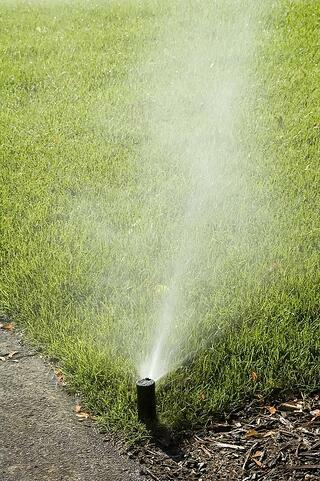 During times when the irrigation system is in use, a property owner would immediately realize it was gone. You can protect your backflow prevention device by taking some basic steps during irrigation system winterization, which is on the fall checklist for every commercial property with an irrigation system. Here are some solutions to stop theft. Move the backflow preventer indoors: While not always an option, sometimes a backflow can be installed in a utility room so the unit is always behind a locked door and kept safe inside the building. Secure the backflow preventer: Some property owners choose to create a concrete pad equipped with a chain and lock next to the backflow preventer. Then, the backflow preventer can be securely chained down and locked to the concrete to deter thieves. Construct a backflow preventer cage: A cage can be built to surround the backflow prevention device. This would certainly discourage a thief from stealing a backflow preventer. Attach quick couplers to the backflow device: By attaching quick couplers to a backflow prevention device, it can be more easily removed for indoor storage and then simply reattached in spring. Now is a great time to be thinking about ways to protect your backflow prevention device so you don’t end up spending thousands of dollars in spring to replace a stolen one. Don’t allow your backflow preventer to be a target for theft. Come up with a plan to stop theft—moving the device indoors, securing it with a chain and lock, etc.—and implement the plan upon winterizing your irrigation system. Let’s talk more about ways to maximize your irrigation system efficiency, steps to prepare for winter and what landscape tasks you should be considering even as the weather turns. Contact us in Lexington at 859.254.0762 and Louisville at 502.264.0127. Or, fill out this simple contact form and request a proposal.